Grandma's practical cake baking tips will prove helpful when trying any of the old fashioned cake recipes. From knowing how Grandma baked her cakes, you'll be able to follow the older recipes and consistently make deliciously moist cakes you'll be proud to serve for any occasion. Baking perfect cakes from scratch is an art that's easily learned. Back in Grandma's day, baking cakes was a weekly event. They were always good to have on hand if company came and for taking on Sunday picnics. But, you had to make them yourself. Store-bought cakes were considered too expensive to buy. Besides, they simply didn't taste as good as a homemade cake made from scratch. You'll have noticed that many old fashioned recipes are somewhat skimpy on baking instructions, so experimenting with the recipes is sometimes necessary and always part of the fun. These old fashioned cake baking tips will help to ensure you get a successful result. I purposely include several recipes of the same kind on each webpage since usually one or two of the recipes will suggest a specific baking time, the type of baking pan to use, and so on. What one recipe suggests will often work with the other recipes on the page too. The good news is the old-style baking recipes are often very forgiving which is why many simply say or imply, "bake until done." 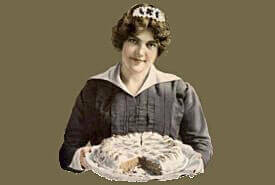 The big trick successfully used in baking old fashioned cakes and other baked goods is to test "often" for doneness. Cake will never be better than the things whereof it is made, no matter how skilled the maker. But it can be, and too often is, dismally worse, thus involving a waste of heaven's good gifts of sugar, butter, eggs, flour, and flavors. Having the best at hand, use it well. Isaac Walton's direction for the bait, "Use them as though you loved them," applies here as many elsewhere. Have the eggs very cold, butter soft but not oily, flour dry and light — oven dry it in muggy weather. Let the butter soften well before undertaking to cream it. A stout, blunt wooden spoon is the best for creaming butter, along with a deep bowl very narrow at the bottom. 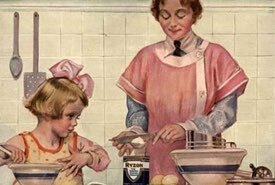 Sift flour three times for ordinary cakes, twice for tea cakes, and so on, four to five times for very light things, sponge cake, angel's food, and measure it before sifting, and don't forget the needed amount — then you will be in no danger of putting in too much or too little. Always put a pinch of fine salt in the bottom of the mixing bowl, which should be freshly scalded and wiped very dry. A damp bowl clogs with either sugar or flour, making the stirring much harder. Unless specifically directed otherwise, separate the eggs, set the whites on ice till time to whip them, beat the yolks very, very light — to a pale, frothy yellow; add the sugar, free from lumps, a cupful at a time, then the butter beaten to a creamy froth, beat hard together for five minutes, then add alternately the flour and the egg whites beaten to the stiffest possible froth. Add a pinch of salt as beating begins, and if the egg supply is scant, a teaspoonful of cold water to each white. This will increase the quantity and help to make the cake lighter, as it is the air bubbles imprisoned in the froth which give it its rising virtue. Add fruit and flavoring last thing. Fruit should be well floured but never clotted. If batter appears to be too stiff a little whisky thins it excellently, and helps to make it lighter. Put in two tablespoonfuls to six eggs, using more in proportion. Rose water or a liqueur have the same effect but give their own flavor — which whisky does not. Grease deep cake tins plentifully, with either lard or butter — using only the best quality. For heavy cakes such as fruit, spice, and marble cake, line tins with double thicknesses of buttered paper and either set shallow pans of water in the oven while baking or stand the pans themselves in other pans with a quarter inch of water in the bottoms. If cakes brown too fast, open the oven door, a trifle, and lay over the pan a thick, well buttered paper until the oven cools. The oven may be cooled quickly, if necessary, by putting a pan of cold water in it. Never jar the oven while cake is baking in it — neither by banging the door, nor dumping heavy vessels on top of it. Beware likewise slamming kitchen doors, or bumping things about in the room. Fine cake demands as many virtues of omission as of commission. Indeed, the don'ts are as essential as the doings. Layer cakes need to be mixed thinner than deep ones. The batter must run freely. Half fill the tins and set in a hot oven, taking care not to scorch before rising is finished. 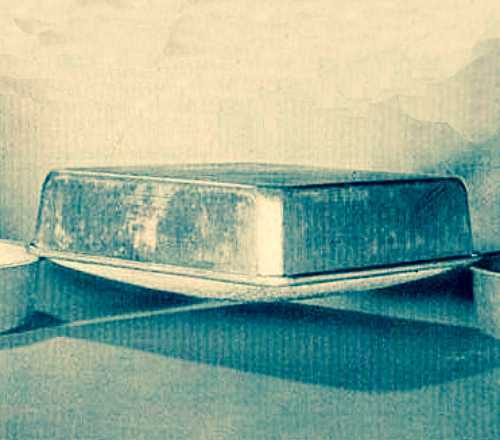 Butter tins very freely — it is economy in the end. 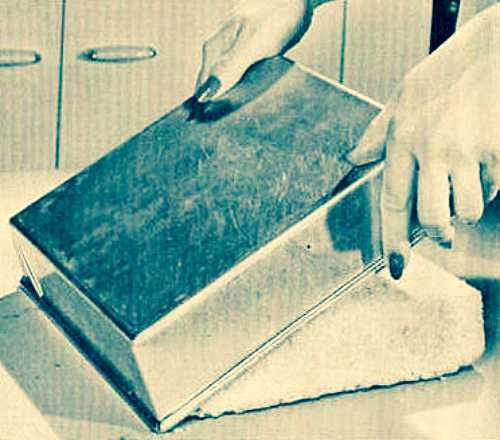 Be sure the cake tins sit level in the oven — thus you escape an ungainly final loaf. Get filling ready as baking goes forward so as to put your layers together while still warm and pliable. A cake which cracks open during baking indicates either that too much flour has been used or that the oven has been too hot at first. A coarse textured cake denotes the use of too much baking powder or too little beating. A cake that falls after baking indicates too little flour, too much shortening, or insufficient baking. Let cake cool before frosting, so as to trim sides smooth. Take care fillings are not too watery, also that they are mixed smooth. Spread evenly, and press down a layer firmly all over, before putting filling on top. Layers simplify greatly the problem of baking, but to my mind, no layer cake, not even the famous Lady Baltimore, is equal to a fine deep loaf, well frosted, and meltingly rich throughout. Be sure to remember the following cake baking tips, as you'll find them helpful once your cake is baked. To cool layer cakes, sheet cakes, or loaf cakes, carefully turn them upside down so they rest on the edge of two pans. This setup allows air to circulate all around cake for cooling. To remove square cake, oblong cake, or loaf cake from pan, loosen sides with spatula, or knife. Turn the pan upside down. Give edge of pan a sharp tap on the table and cake will release. When your round angel cake is thoroughly cool, loosen side with spatula or knife. Turn your pan upside down. Hit edge of pan sharply on table to remove cake. As for the size of cake pan to use, what I sometimes do is to have a couple of medium-sized pans (or one medium-sized pan and one smaller pan) ready for the cake batter. In the end, I might only require the use of one pan, or I might use both. You can usually decide what size of pan is needed by judging the quantity of batter. You can easily calculate the capacity of any cake pan by measuring the water it takes to fill it, then compare to a rough estimate of the cake recipe's ingredients measured in cups. Remember, layer cake pans should be only half-filled with cake batter to ensure the cake rises evenly. If you find yourself trying to fit a round cake into a square pan or baking a cake in layers, you might find the following baking pan conversions helpful. 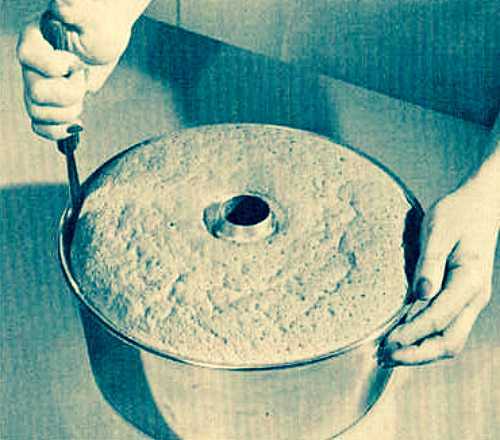 Equivalent to 2 9-inch round pans, 3 8-inch round pans, 1 10-inch Bundt pan, about 2 to 3 dozen cupcakes. 1 8-inch square pan, 1 9-inch square pan, 1 10-inch pie plate, about 1 to 1-1/2 dozen cupcakes. Equivalent to 2 8x4-inch loaf pans, 2 8-inch round pans, 1 9-inch tube pan, 1 10-inch Bundt pan, 1 10-inch springform pan, about 1-1/2 to 2 dozen cupcakes. Equivalent to 1 10-inch round pan, 1 10-inch springform pan, 2 8-inch round pans, 2 9-inch round pans, about 1-1/2 to 2 dozen cupcakes. Equivalent to 3 9-inch round pans, 2 10-inch pie plates, 4 8-inch pie plates, 2 9x5-inch loaf pans, 2 8-inch square pans, about 2 to 3 dozen cupcakes. Equivalent to 1 9x13-inch pan, 2 9-inch round pans, 1 9-inch tube pan, 2 11x7-inch pans, 1 10-inch springform pan, about 1-1/2 to 2 dozen cupcakes. Sponge cake = three-quarters of an hour. Pound cake = one hour. Fruit cake = three and four hours, depending on size. Cup cakes = one full half-hour. The time of baking may be divided into three periods, having the oven only moderately hot at first to allow the cake to rise, increasing the heat a little to form a crust and brown the surface, and lowering it again to thoroughly cook the cake to the center. Most cooks know the time-honored ways of telling when a cake is done — a splinter inserted in the center comes away clean, the cake shrinks from the sides of the pan, and it gives no steaming or crackling sound. 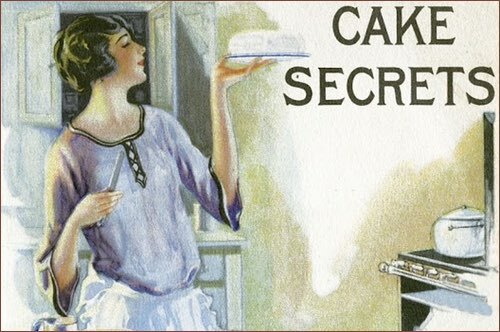 Many old fashioned cake recipes did not specify exact cooking temperatures, but simply suggested using a slow, moderate, or quick (hot) oven. My Oven Temperature Conversions will help you to get proper results when using the old time recipes. 8 average sized cakes will serve 100 people. 12 pound cakes will serve 100 people. 1 pound cake serves 10 to 12 people. 1 cake eight inches by eight inches may be cut into 20 pieces. 1 pound loaf or square cake serves 10 people. You'll notice that some types of old fashioned cake recipes might call for a "pinch of salt" or "salt to taste," but many do not. Since I try to offer the historical recipes exactly as first published to preserve the historical taste of the finished dessert, I've not added or modified the called-for ingredients. Why was salt not a common ingredient in old fashioned cake recipes? 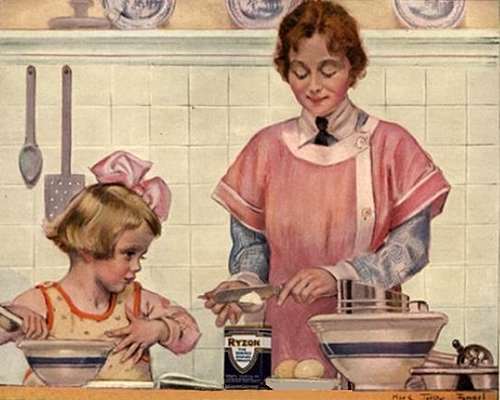 It's thought by some food experts that our modern palate craves a saltier taste because of the highly processed foods we've become accustomed to, whereas a less salty taste was considered normal in great-grandma's day when everything was home baked — and healthier. Please feel free to modify the old fashioned recipes to your preferred taste or available ingredients; that's all part of the fun when experimenting with old fashioned baking methods. Be sure to return to these old time cake baking tips whenever you need some help.